The question of when you need to change your oil used to be answered by your local shop, which had a vested interest in keeping your car coming back every 5,000km. Nowadays, this question is more frequently being answered by a vehicle’s oil life monitoring system. This alert usually arrives between 8,000-13,000km – saving drivers cash and reducing the amount of oil being disposed. But how reliable are these systems? Studies have shown that oil life monitors are quite reliable; however, they are not quite as “set it and forget it” as dealers would have you believe. Read on to learn how to properly manage your oil life monitor to make sure you aren’t left dealing with pricey repairs. What is an Oil Life Monitor and How Does It Work? Oil life monitoring (OLM) systems were first introduced in the late 80s. These systems have electronic sensors throughout the drivetrain that sends information to the car’s computer. These sensors collect data on distance, time, engine temperature, trip durations, engine revolutions, and much more! As the computer is fed this information, it’s run through a mathematical algorithm that will then predict when the oil will begin to degrade. Engineers have figured out a fairly accurate way to calculate the remaining oil life without actually having to sample the oil. 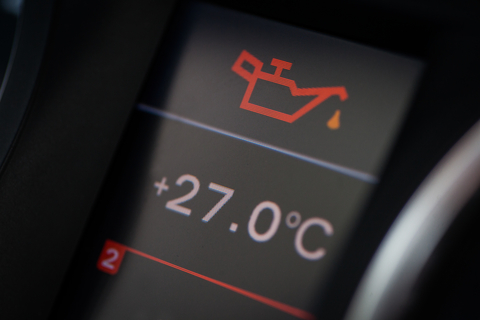 You’ll then be notified by a light or message letting you know when it’s time to change your oil. Don’t worry – the light always comes on well in advance, giving you lots of time to make an appointment. Not all vehicles have an OLM system, so be sure to check your owner’s manual to find out if your vehicle is equipped with one. Oil Life Monitoring systems are (thankfully) pretty accurate! Studies have shown that when the same vehicle was subjected to both around-town driving and then highway driving, the warning light came on much later during the highway driving. Meaning the system had detected different driving conditions and adjusted accordingly. The best thing about an oil life monitoring system is that they free you from having to decide when you need to get your oil changed. Oftentimes, quick oil change shops encourage frequent oil changes for everyone and don’t even consider your driving habits. This means that you could be changing your oil more frequently than it needs. However, if you don’t read the fine print, you can be left on the hook for expensive repairs. Many car companies require you to have your oil life monitor checked at regular intervals to make sure things are working properly. Other companies will require you to have your oil checked at regular intervals, even if the warning light has not come on, and then let the shop decide whether or not you need an oil change or if you can drive a bit more. Failure to comply with any of these conditions and you may find that your warranty is void. As long as you read your user manual to make sure you understand what guidelines you need to follow to keep your warranty intact, there is no reason for you not to let the OLM take on the job of notifying you when your oil is in need of replacing. Note: It’s always recommended to have your oil checked at least once a year, regardless of how much you drive (and even if your system hasn’t alerted you)! If you have questions or are looking for help servicing your oil life monitor, stop by Park Muffler today.